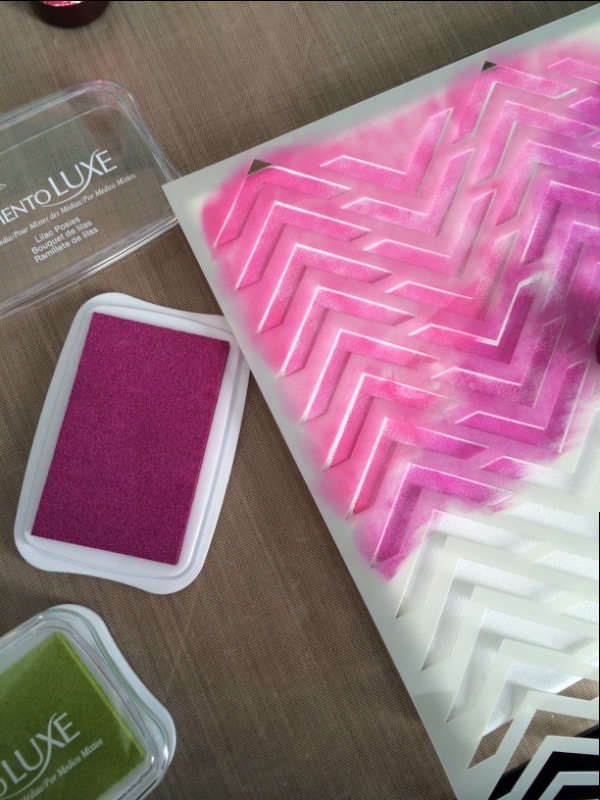 You can win 3 of the brand new Radiant Neon™ ink pads and 3 jars of our Color Fragments! We’ll give away three prize packages (color is our choice) to U.S. Mailing addresses. You have until the end of Sunday, May 25 to comment on as many of the Design Team Blog Posts from this week as possible. Monday we’ll draw three random blog posts and one comment from each of those posts will win a prize package! Here are the designers with some inspiration for you today. Be sure to leave them some appreciation when posting your comments on their posts. So are you ready for some exciting inspiration? ***Blog Hop Hint – if you click on a link that takes you to a page saying something like, “Sorry this page cannot be found,” just click on the header at the top of the blog (usually a picture, or the blog’s name), and it will take you to that blog’s most recent post. That post *should* be our hop. If not, you can probably scroll down a short way to find the hop post. You can check out the Official Rules for all our contests if you have questions. If you missed any of the previous days of the Hop, select one of these links to take a look at the artists and the projects that they created: MONDAY May 19th, TUESDAY May 20th, and Wednesday May 21st. 1. Start with a canvas banner. 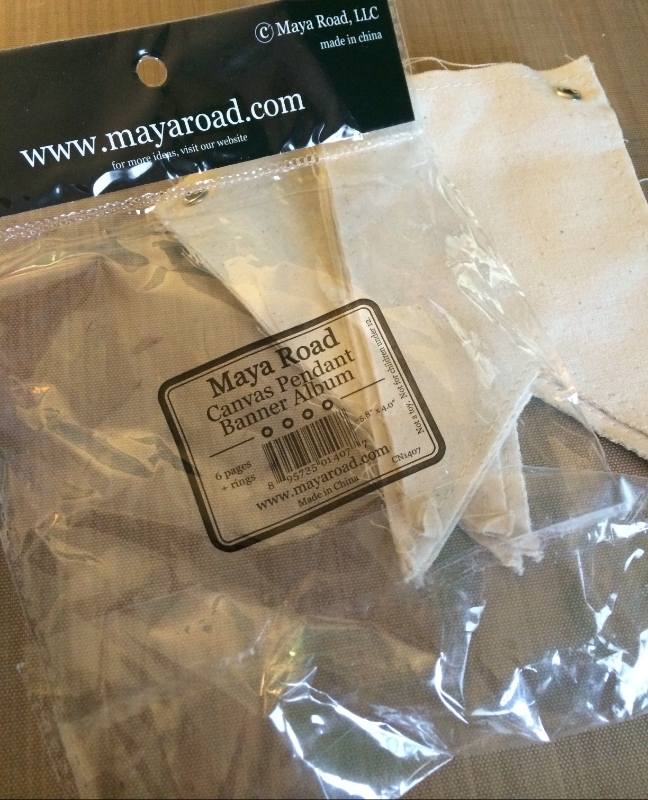 I used the Maya Road Canvas Banner album for this project which contains 6 pieces so you can take it apart and make one large banner or two small banners. 2. 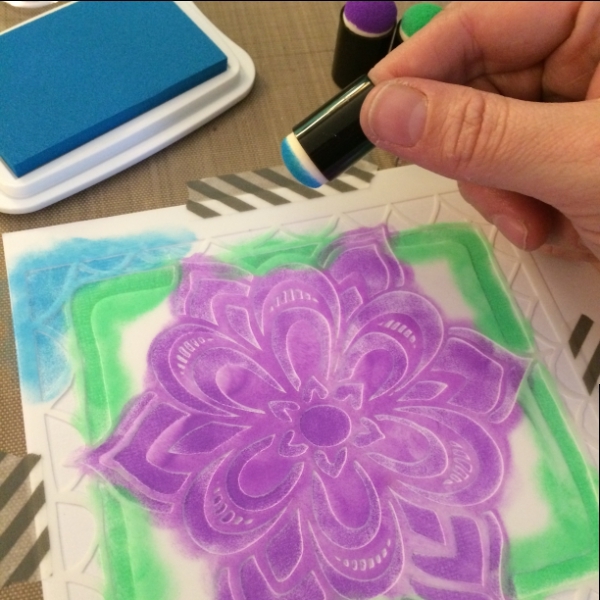 Place stencil onto the canvas piece. 3. 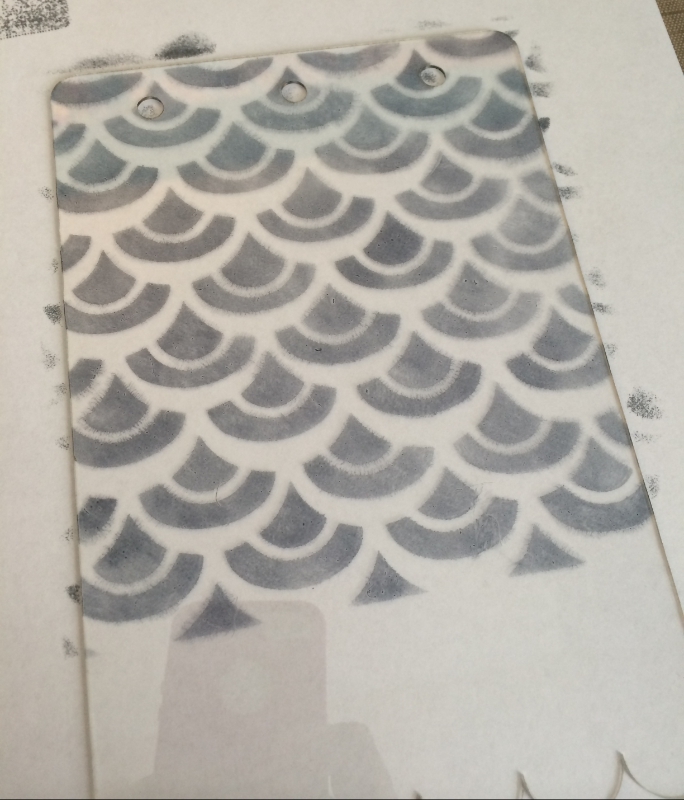 Ink the brayer with Kaleidacolor inkpad, being sure that the entire brayer is inked. 4. 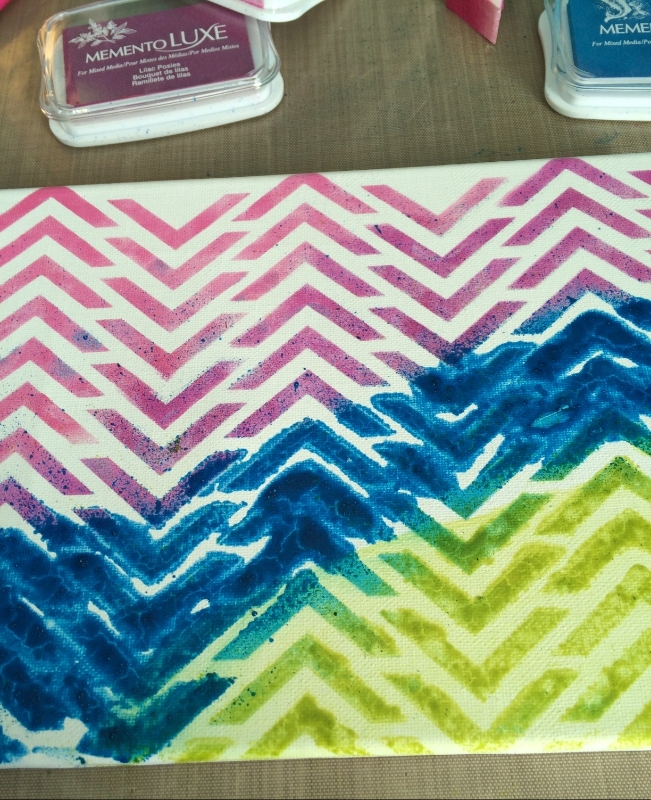 Roll over the stencil to color the canvas piece. 5. Repeat for each of the banner pieces (if creating multiple). For this project I used different stencils for each banner piece. 6. 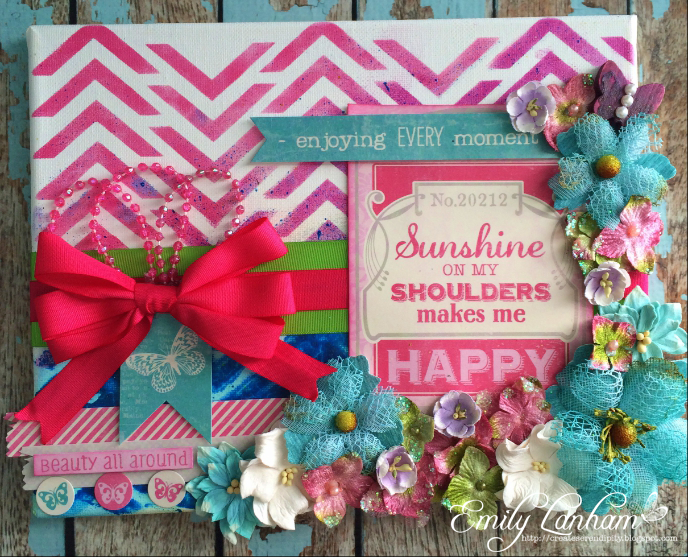 Embellish with letter stickers, flowers, and ribbon. 7. Connect banner pieces together to complete project. 1. 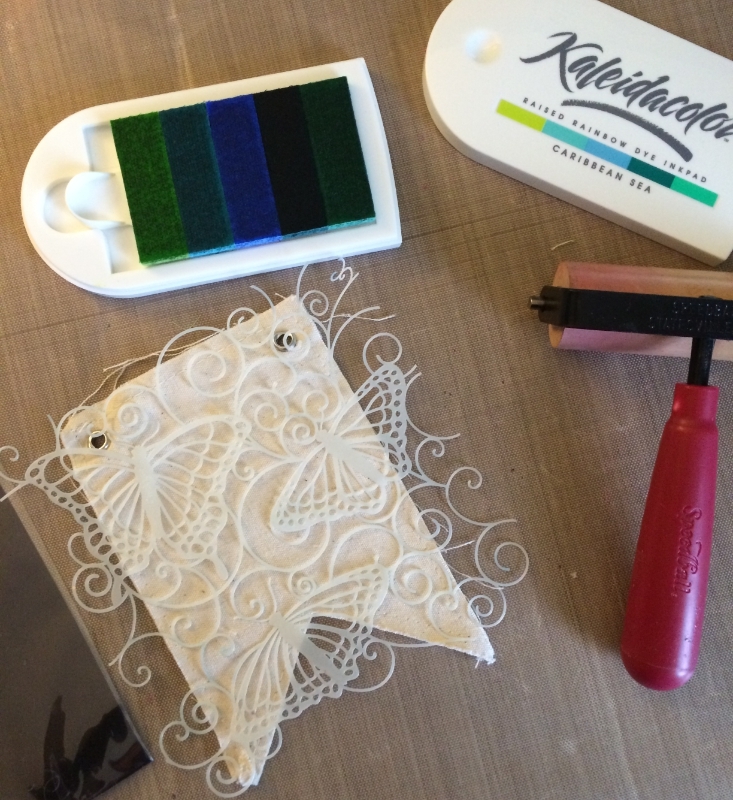 Nest Spellbinders Filigree Cross inset into the Border and secure with low-tack painter’s tape. Cut/emboss Taffeta Vertigo using a Metal Shim and the Artisan X-Plorer. 2. Lay the Filigree Cross border onto Tilted Vertigo and trace around the outside edge of the die with a black pen. Cut cross with a pair of scissors. 3. Apply StazOn Gothic Purple to the solid Vertigo cross with a Sponge Dauber. 4. With a Fantastix, apply Delicata Golden Glitz ink to the edge of the solid Vertigo cross. Adhere the Taffeta Vertigo Cross to the solid Vertigo Cross. 5. 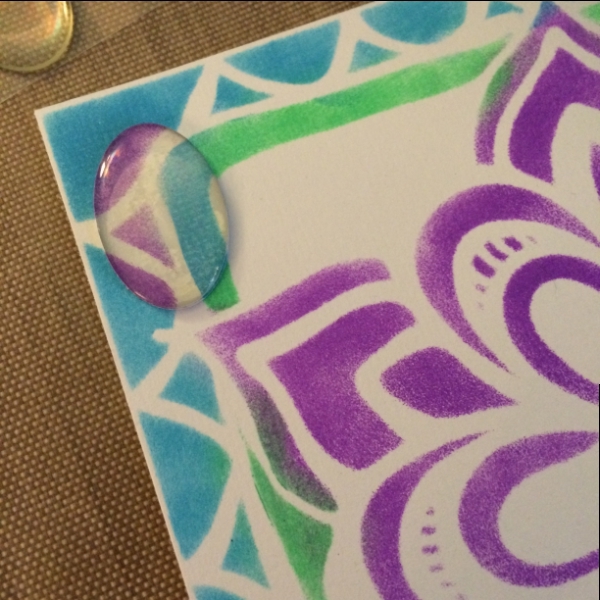 With a sponge dauber, add Gothic Purple ink to white self-adhesive pearls and decorate your cross. Add a charm to the center of the cross. 6. Punch a hole in the top of the cross and add ribbon and crystal beads. 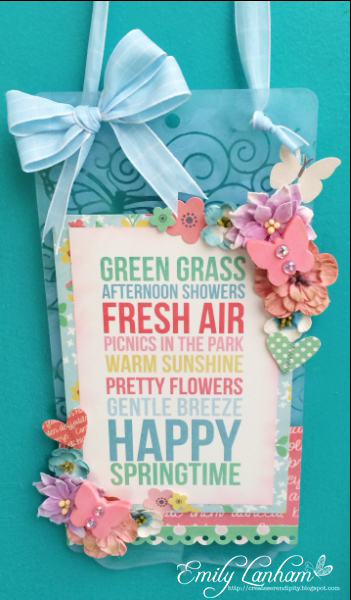 To create this fun Spring wall hanging, you will need a piece of acrylic (ClearScraps mini albums work great for these), a stencil, StazOn ink. You MUST use StazOn on acrylic or it will rub off. 1. Tape your stencil in place. 2. Using a Sponge Dauber, lightly daub the StazOn ink over the stencil. 3. Lift off the stencil. Finish the edges with StazOn Opaque Baby Blue. 4. 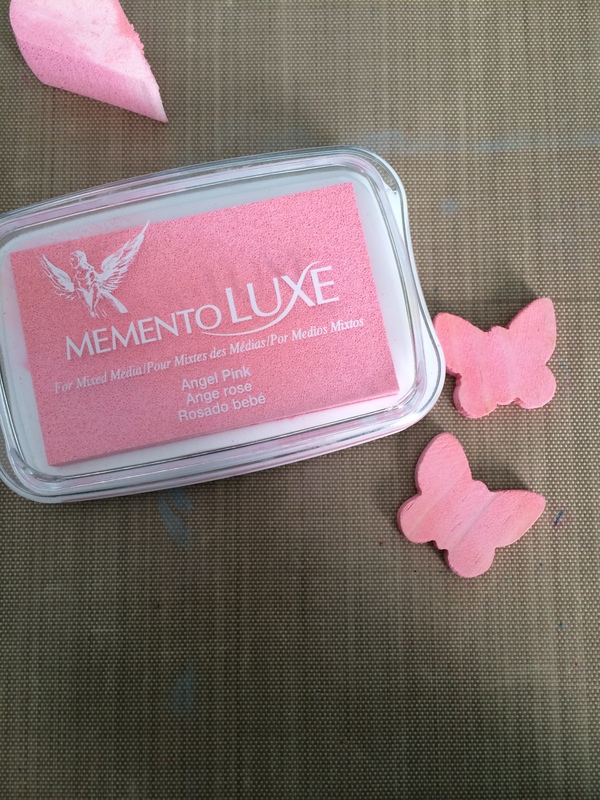 Using Memento Luxe ink and an InkBlusher, color the Monterey Pine Butterflies for embellishments. 5. 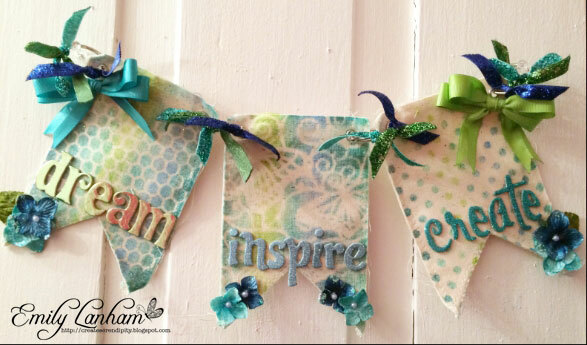 Add paper, ribbons, and other embellishments to complete your wall hanging. 1. 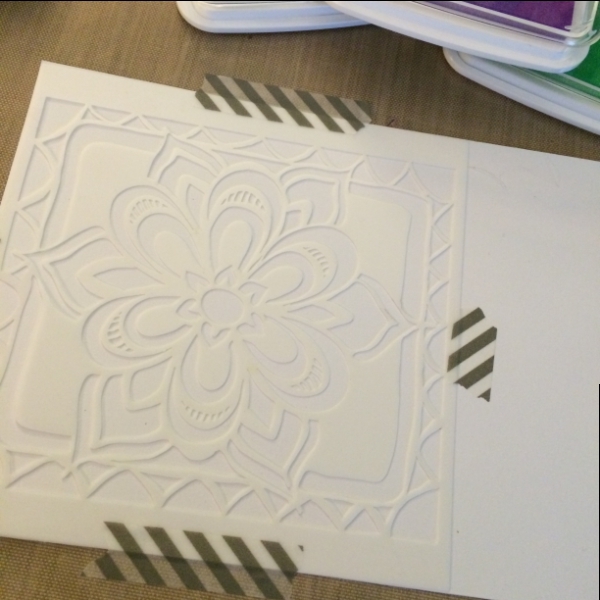 Securely tape your stencil to a piece of white cardstock. 2. 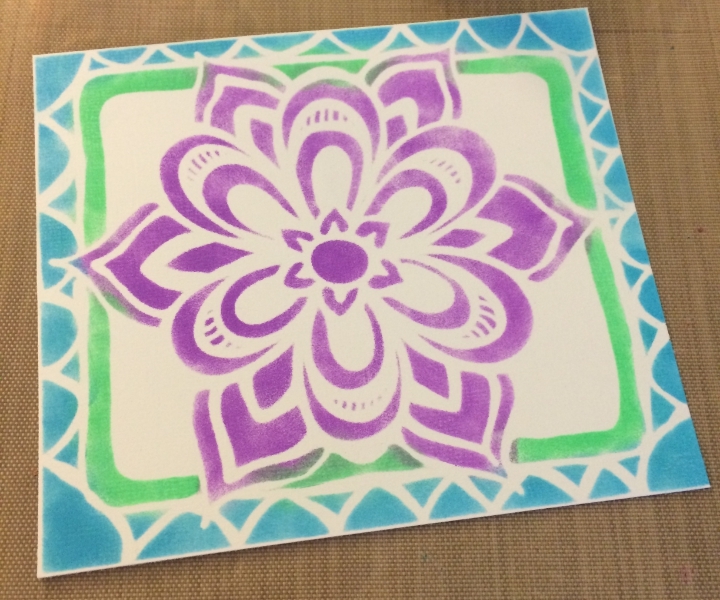 Using daubers, ink in the stencil with the colors of your choice. 3. Your image should now look like this. Set aside. 4. On another piece of paper, use the same technique, but alternate the colors that were used. 5. 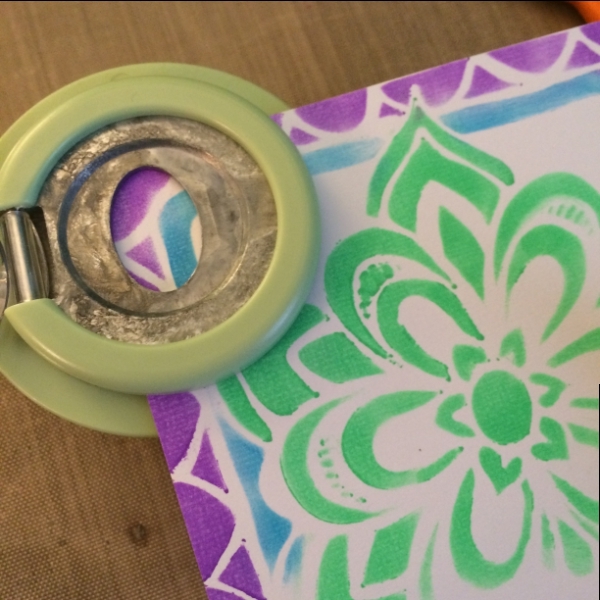 Using an Epiphany crafts punch, begin to punch shapes from the second piece created. Add bubble caps to punched pieces for dimension. 6. Lay the bubblecap over the coordinating part of the image on sheet #1 and adhere. You will get this cool effect. 7. 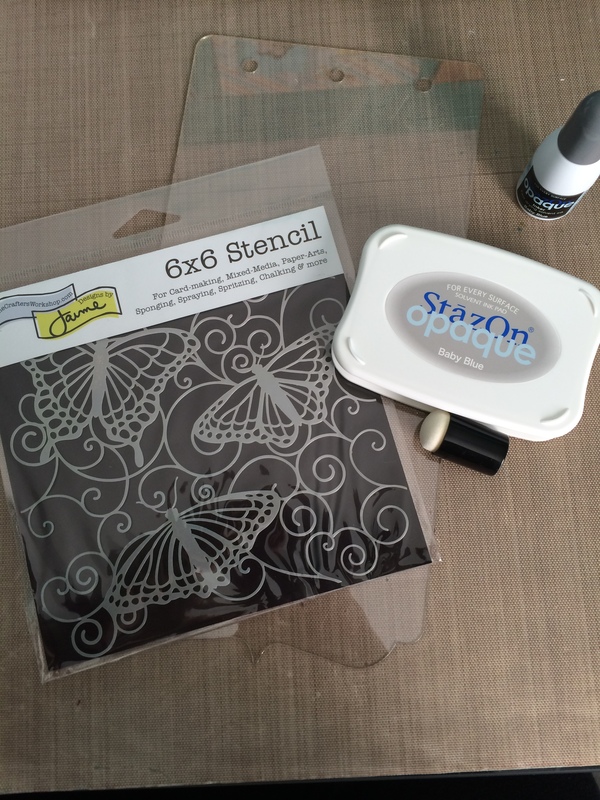 Stamp a sentiment on a piece of clear plastic with StazOn Jet Black. I used a recycled piece from an old box. 8. 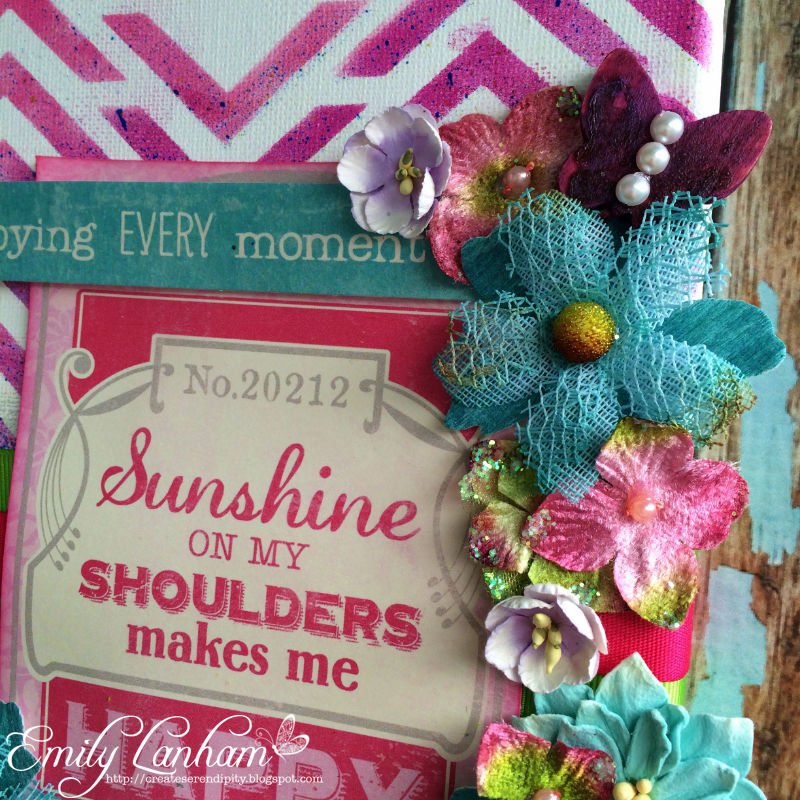 Add sentiment to card and embellish. 9. Color Monterey Pine Butterfly with Radiant Neon inks. 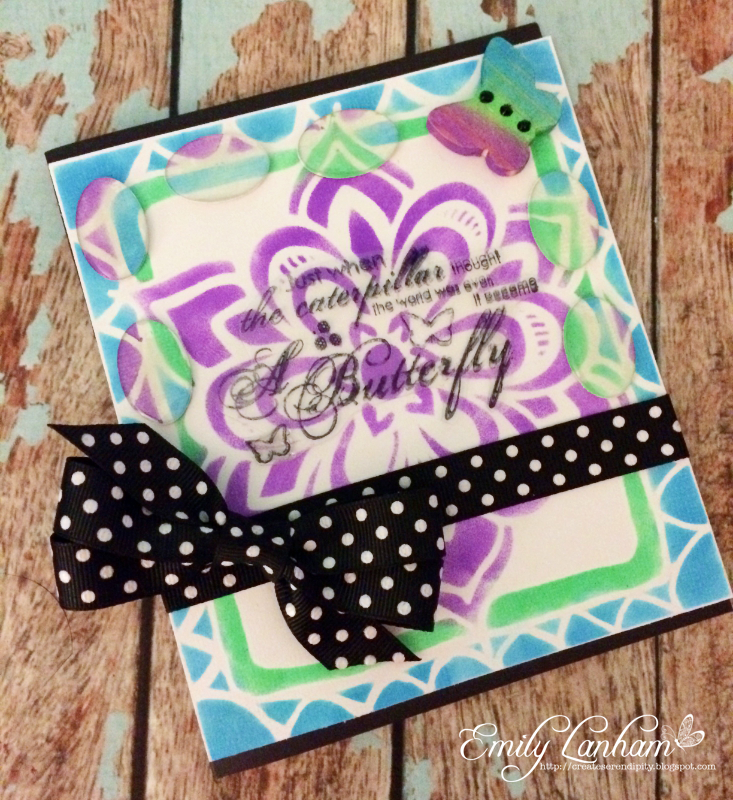 Embellish with dimensional dots and adhere to card. Time for some Spring inspiration from our Artists In Residence! 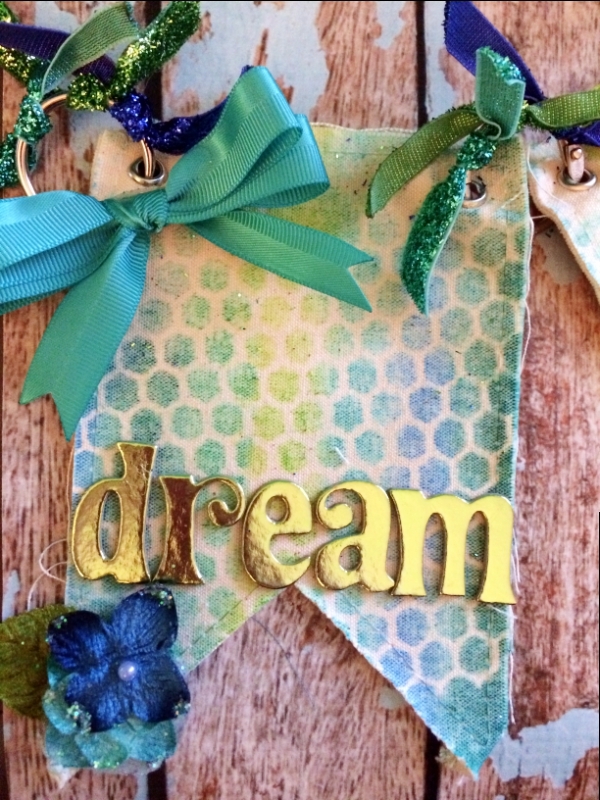 Today Darsie is here to share with you an elegant card created with Delicata. Emily breaks out the Radiant Neon inks with irRESISTible texture sprays for a splash of color on canvas. 1. 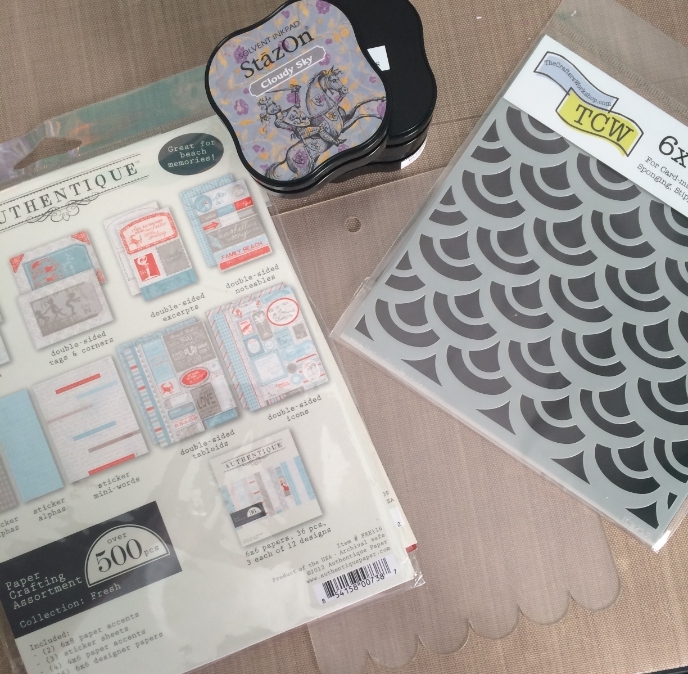 Apply Delicata Shimmery Silver ink to JustRite Papercraft’s large background stamp and stamp on black cardstock. 2. Cover stamped image with clear embossing powder and emboss with a heat gun. 3. Swipe Delicate Golden Glitz across the surface of your stamped background. 4. 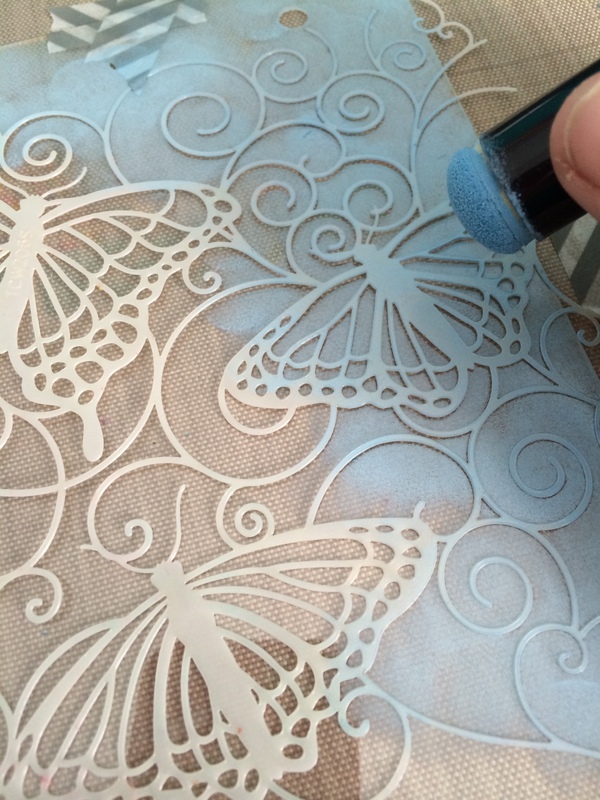 Gently wipe excess Golden Glitz ink from the embossed areas of your background with a tissue. Once dry, trim to edge of stamped image. 5. 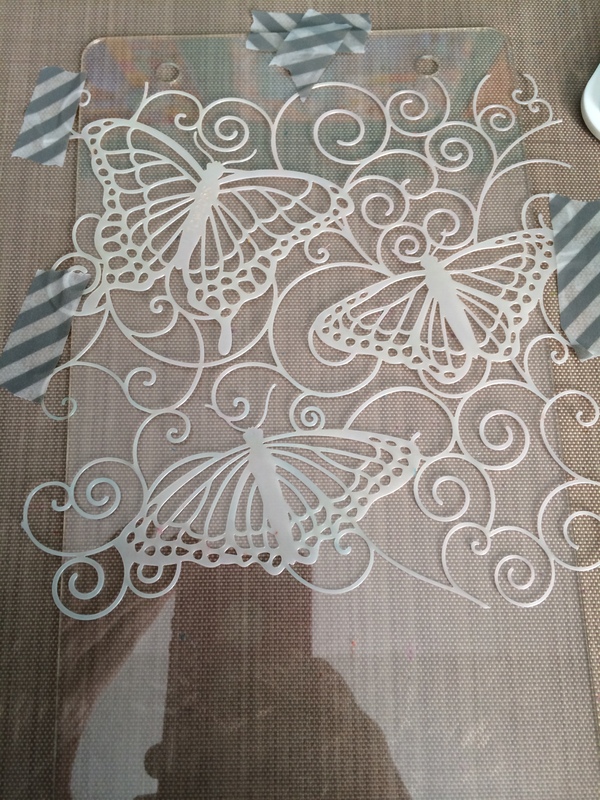 Cut/emboss Spellbinders Ornate Butterfly from black cardstock, then ink with Shimmery Silver. 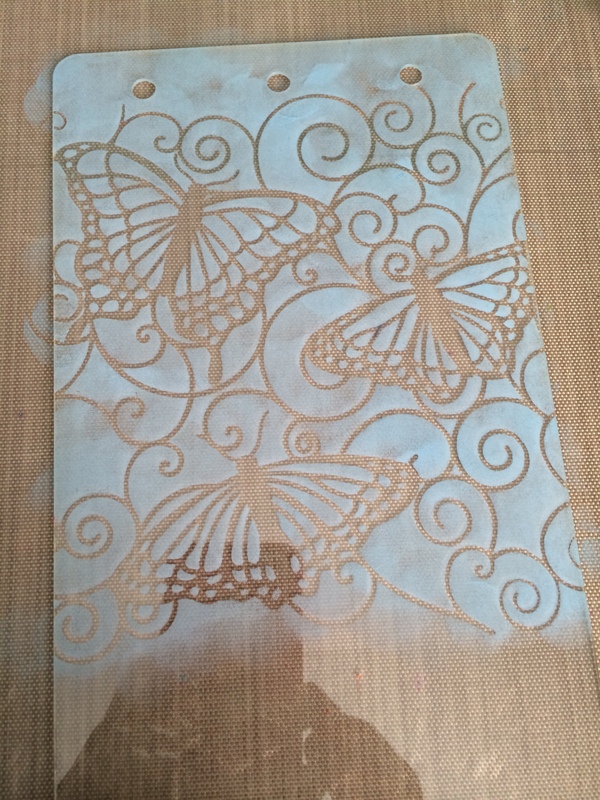 Sprinkle clear embossing powder over butterfly die cut and emboss with a heat gun. 6. Cut/emboss A2 Divine Eleoquence tag from black cardstock. Stamp JustRite Papercraft sentiment with Golden Glitz ink and emboss with clear embossing powder and a heat gun. 7. Adhere background panel to a black panel, then to a silver card base. 8. Add foam squares to sentiment tag and affix to upper right corner and cut edge of tag to align with background stamp. 9. 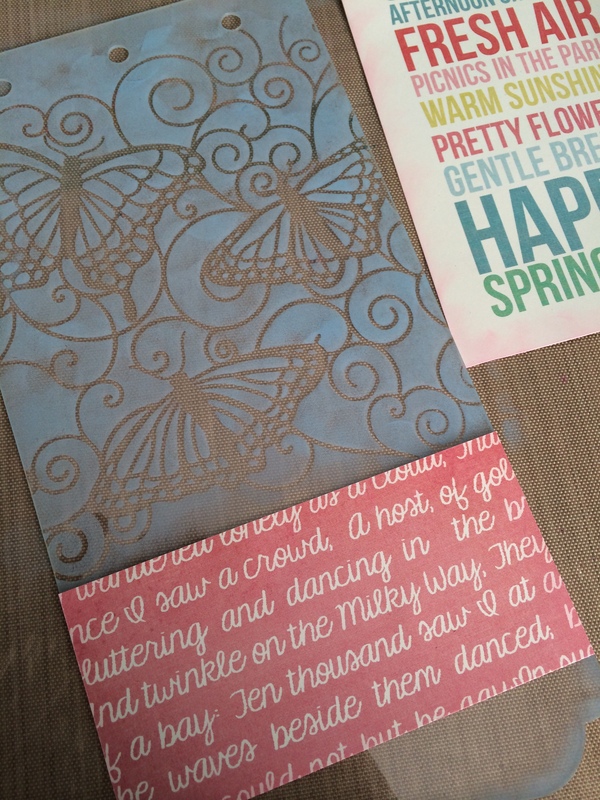 Add Shimmery Silver butterfly to lower left portion of card and add gold pearls to finish. 1. 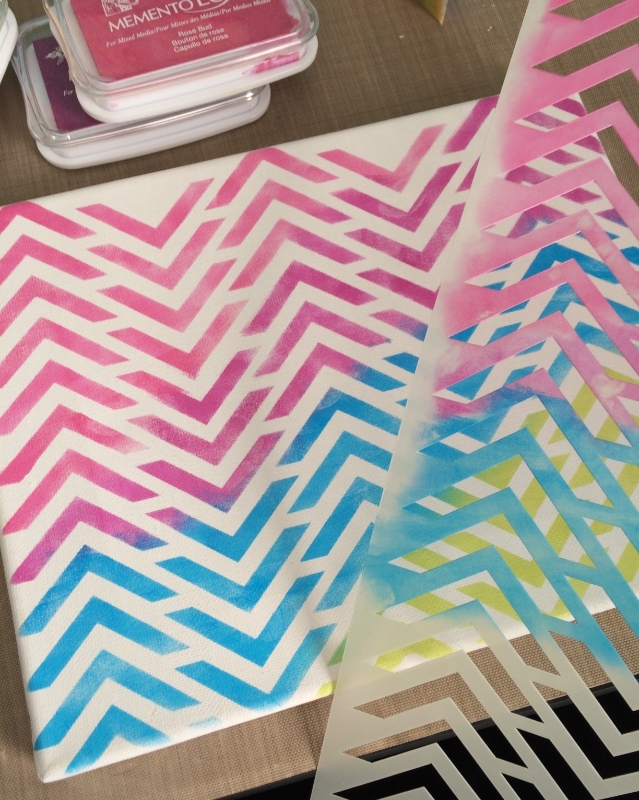 Layer your stencil onto your canvas where you want it. You can use Memento Luxe for this project or NEW irRESISTible spray, or if you chose, you can use both. 2. 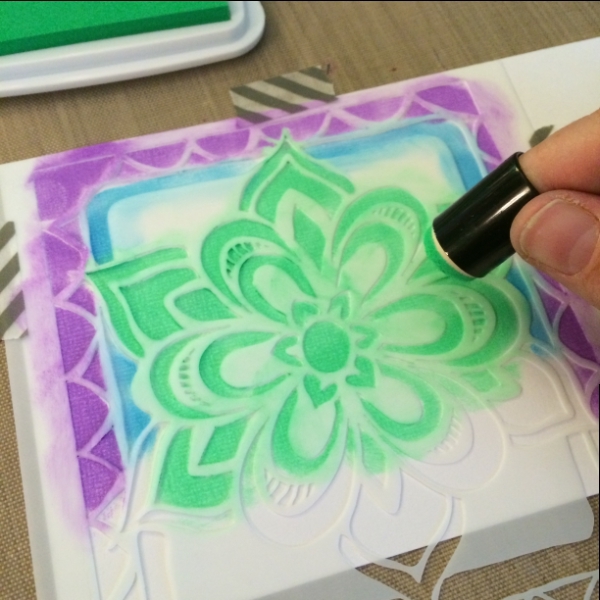 Start by using an InkBlusher to spread ink across the stencil blending colors along the way. 3. 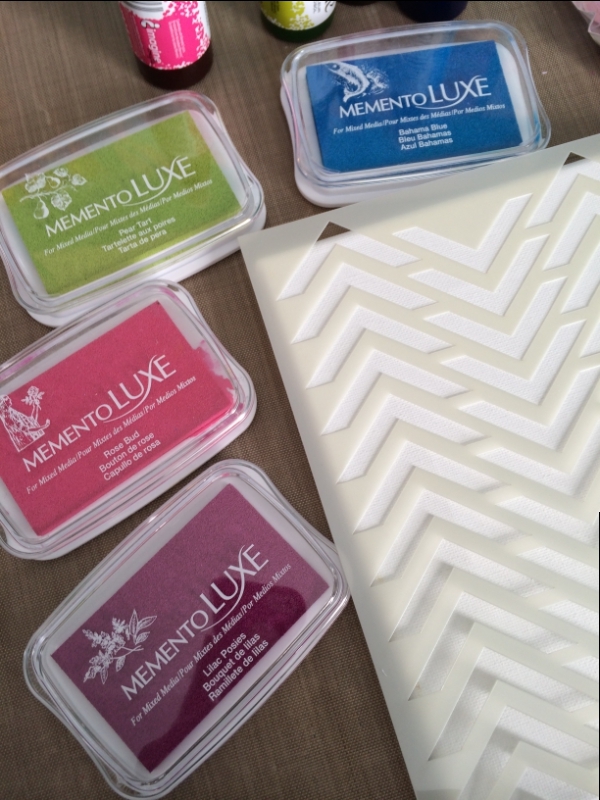 If you use Memento Luxe for this project, your end result will look like this. 4. If you want the color but want a “resist” effect so you can fill in the white space, use irRESISTible and spray across the canvas. Be careful not to spray too much (like I did on the blue area), it will bleed behind your stencil so hold stencil slightly above when spraying onto your canvas. 5. 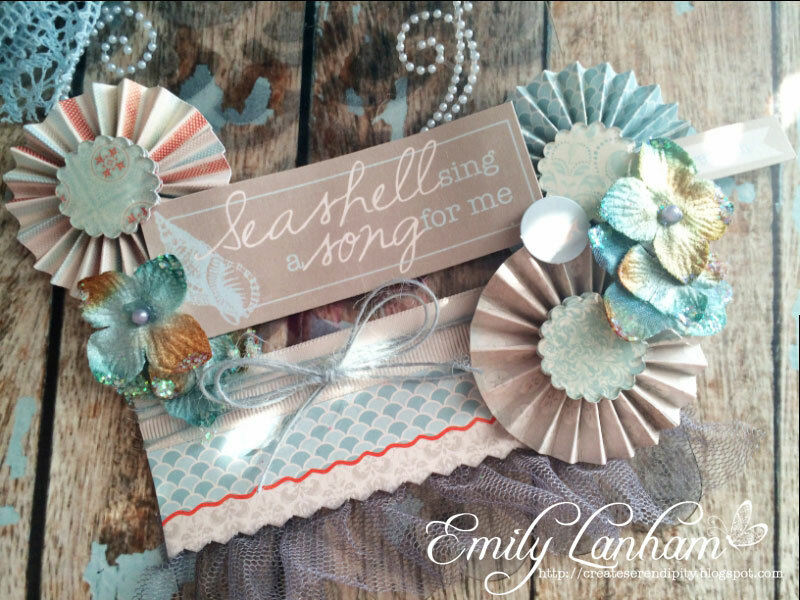 Embellish with ribbons, flowers, paper, stickers, etc. You can also dress this project up by spraying some Monterey Pine with the irRESISTible spray like I did here on the butterfly. 1. Spray irRESISTible Grape Jelly onto white cardstock, then spray irRESISTible Danube Blue and irRESISTible Cottage Ivy and allow to dry. 2. Cut/emboss the peacock feather from Spellbinders Feather in the Wind die set from your irRESISTible panel. 3. With the die cut remaining in the die, swipe Versamark on the exposed areas on top of the die template. 4. 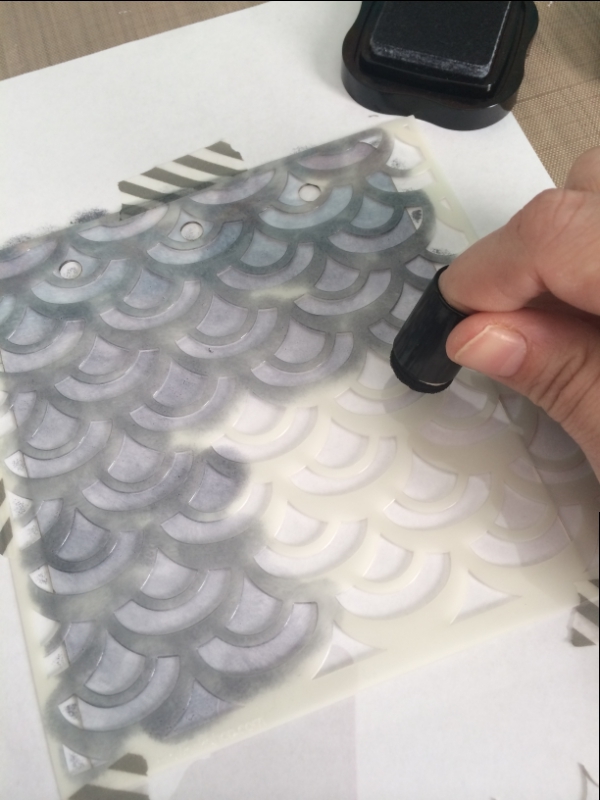 Remove die cut from template and emboss with silver embossing powder. Make 2 of these. 5. Cut a white panel, sized 4 x 5 1/2 inches and add washi tape on left side. Adhere peacock feathers to panel. 6. Stamp JustRite Papercraft sentiment with Tuxdeo Black ink in lower right corner. 7. 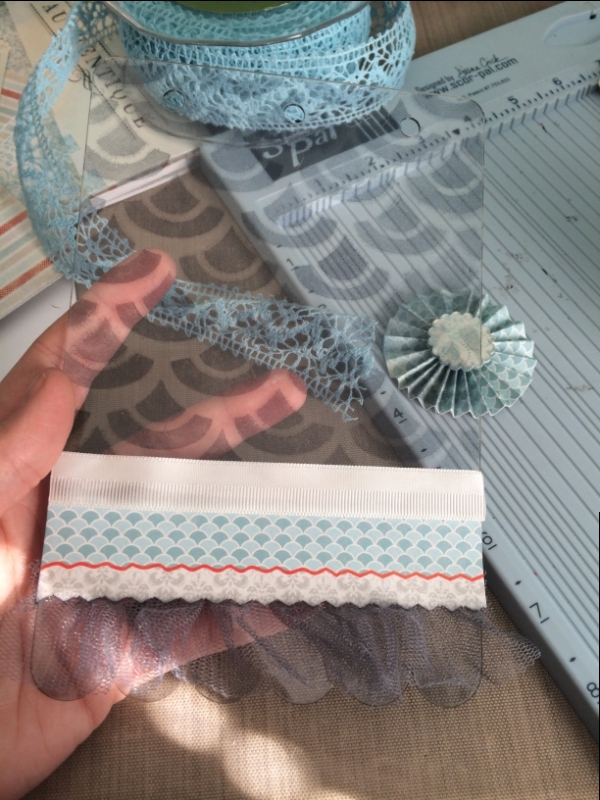 Adhere panel to silver glitter cardstock, wrap with silver cord and tie a bow then glue to a black card. 8. Add rhinestones to feathers and above stamped sentiment. Step 2: Take a piece of acrylic from the mini album. This will be your base. 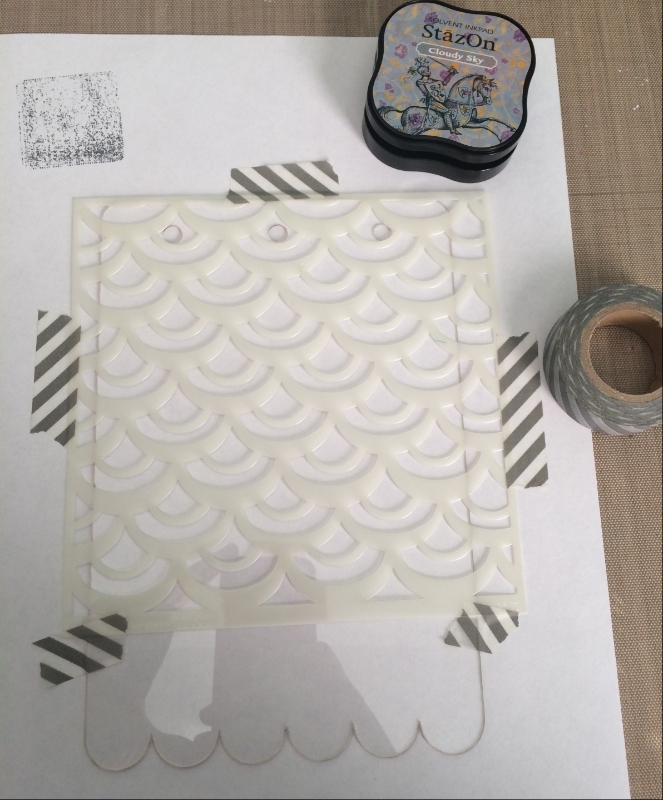 Tape a stencil of your choice on top so it is secure in place. 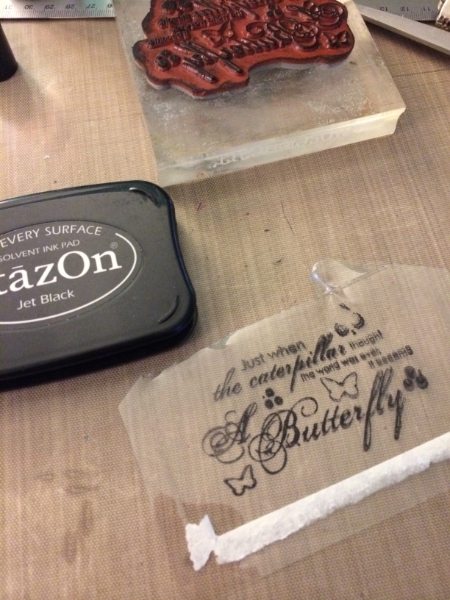 Step 3: Begin daubing StazOn ink over the stencil onto the acrylic wit ha sponge dauber. You MUST use StazOn ink or the ink will not stick to the acrylic and will smudge. Step 4: Set aside and let ink dry completely. Step 5: Embellish with paper, ribbons, etc of your choice. Tie a ribbon through the top holes to hang for display.